I’ve been a fan of John Leguizamo’s films for a long time but, until Continental Drift, had never seen an Ice Age movie before. I guess it never really struck me as a must-see.I have no kids but my nieces and nephews are always watching the first one so I feel like I get my fill whenever I visit them. First of all I recommend this fourth one. It’s funny and lighthearted and carries with it a great message of family. I was excited to talk to John about his career and his character in this series. Having three comedians in the lead role (Leguizamo stars with Ray Ramano and Dennis Leary) means that the funny comes fast and furious but Sid the sloth remains the film’s comic relief. In my extended interview with the intense actor we discuss his attraction to animation and what role his family plays in his career. During the course of my interview it dawned on me how many movies he’s been in and how those movies have been important to me as an audience member. From ‘Executive Decision’ to ‘Titan AE’ John has put together a very interesting body of work that seems hell-bent on being unique. 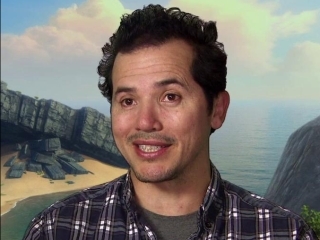 Without further ado, my interview with the talented and energetic John Leguizamo. John Leguizamo: Good good, trying to stay cool, it’s hot. Not as hot as New York is I imagine. Oh man. I need some cold this year. This is weird. We didn’t break any records or anything but it was 97 at JFK last week. Yeah, I was there last week and it felt about that. I loved it though. Last time I was in New York is was pretty cold but being from So-Cal it was awesome walking around Central Park in shorts and sandals. When I was a kid we were praying for 90 degree weather in the summer and we hardly ever got it. And now it’s like, you hit 97 in the spring. But it wasn’t that humid. It was kind of dry last week. VeryArizonaright? So did you see the movie? I did. So I have to be honest, this is my first Ice Age movie. And now having seen it, I’m not sure why that is? I don’t know but it is so funny. It’s funny, it’s got a lot of depth and they always made sure they had a really strong message. Oh yeah, Pixar is a god, you can’t say anything- we’re a monotheistic world where there can only be one. I love Ice Age and this one reminds me a lot of the first one. The first one was a little deeper, a little more profound. The second one was funnier. But I think this one combines both. It’s still a really funny story with a good strong message. After I got home from the screening I rented the other three so I could get back on track. Obviously, watch them in order so you can see the progression. They get funnier and funnier and you really see their relationships grow. This one really unites the three guys back a lot like the first one. Each guy has his own strength and all that. Above it all though, the message has always been togetherness, no matter what species you’re from. It’s a great message for this Obama time. Obviously, family is an important message in the film. Weather biological or not, family is the most important thing. What role does your family play in you choosing your next project? Family is everything to me. I think that’s just being Latin that you’re taught that family is everything. It’s pounded into you at an early age. I’ve learned to do the same with my kids, just constantly reminding them what comes first. Everything else is second. My family is very important to me and I guess that’s also why loyalty is very important to me. My family is Mexican so I can definitely relate to the strength of the family thing. All Latin people man, we all have that same message. I don’t know where it comes from. You know, I was talking to my friend Franc Reyes (Director ‘Empire’ ), who I love, he’s a brilliant dude about how similar all Latin people are. We are more similar than we are different. We cook different food but we use the same ingredients. Seeing as this was my first Ice Age flick, I do want to talk a little bit about Sid himself. I’m sure you’ve answered this question a million times so I apologize for my ignorance but, where did the voice come from? Was that something your director had in mind or did you find that organically? The drunken bit really does come across on screen. Ha Ha. Yeah, you can see he’s a little off right? Definitely. This is not the first time you’ve done a voice character. My earliest recollection is actually of ‘Titan AE” a favorite of mine in fact. What attracts you to the medium of animation both as an actor and as an audience member? I don’t think I’m a typical actor in that sense. I always loved Mel Blanc and animation. I spent a lot of my youth loving the way these guys could create a voice that really comes out of these creatures. You really believe that those voices only existed for those animated creations. So, like Mel Blanc, I always wanted to do that. Giving a unique voice and weight to each character was something I always wanted to do. I don’t really like hearing the actual actor because it just reminds me of the actor. I can’t get past thinking “That’s him or her doing the voice” I want to believe this character lived independently from me. It’s interesting you talk about your inspirations but now you’re in a position where people are inspired by Sid the sloth and the characters you’ve created. Is that surreal for you? It’s cool. It is great. It’s funny though because you get dad’s who are like, ‘Hey kids, come over here, that’s Sid the sloth!’ and when the kids come over their shocked. They don’t know what to make of it because they’ve never seen me. So they think ‘That’s not Sid dad’ until I do the voice then they get weirded out even more because now Sid’s voice is coming out of this dude. A lot of actors talk about how they take their characters home with them during filming. Some characters never leave and seep into their daily lives. You’ve played Sid 4 times. What elements of him stick with you? Oh man I can’t shake his lisp. It’s a lateral lisp as opposed to a frontal lisp and that voice will creep up on me even when I’m doing other work on other sets. I have to tone it back sometimes because he’ll just come out. Ha Ha! Do you’re kids still love seeing you as Sid up on screen or are they too old for that now and the honeymoon of dad being a toy has faded? They’re in it!! They do some voices of background characters and small creatures running and screaming and laughing. I love that. It’s a movie about family with the family. It’s a family business, we’re carny folk! Shifting gears for a minute. If one was to peruse your IMdB page, I don’t think comedian would jump right out at them. You play a lot of intense characters on screen. Is it a conscience decision to separate yourself from your comic roots by playing those real dramatic characters in-between roles like this? Well, I gotta be straight up with you; I really started as a regular actor first. I studied with Strasberg and some of the great acting teachers of that era. I was really an actor and then I found comedy later. I mean, I was a cut-up at home but I was a regular actor first and then the two just merged somehow. When I started doing my one-man shows and sketch comedy and improv, I really found myself in that. You’ve done TV, Film and Stage. What do you prefer? I gotta say live is my favorite of them all. It’s the most powerful medium. There is nothing like doing it live. Of the greatest performances I’ve seen in my life, they were all live. Like when I saw Al Pacino in ‘American Buffalo’ or John Malkovich in ‘True West’. Some of these performances stay with you for the rest of your life and you feel like you’re really apart of them. It’s very different than seeing something on screen where it’s more like dream state. But seeing a live performance it enters your body like a living molecule. Man I was 16 when I saw Pacino in ‘American Buffalo’ and I sat in the front row and he spit on me and I felt like I was baptized into acting at that moment. It seems like an obvious choice now to lend your voice to an animated movie, especially with a franchise like Ice Age. That wasn’t always the case for big name actors. Was there ever any hesitation early on about playing a sloth for a movie that wasn’t based on anything? Not at all. I’ve always really loved animation. I think it’s an independent and beautiful art form and I was thrilled about it. It took a long time to get the tone right for the first Ice Age. Chris Wedge and Lori Forte (Producer) and all of us worked really hard to get it just right. It was written as a drama and so we worked hard to get in the right amount of comedy. Chris won an Oscar for his short ‘Bunny’ which is this beautiful, melancholy little piece so that’s kinda where he was coming from. So getting us together, meaning myself and Ray and Dennis, was important to sort of bring in some humor to the film. It was a difficult balancing act. Oh we do!! They want us to do that because unlike some animated movies, we record first and then they draw to our voices. I was relieved to find that out too. We do a lot of ad-lib. It’s very difficult the other way around, which we sometimes have to do. It’s hard to fit different words in their mouths when they’re saying something different. It happens though when you have to change a line. But no, we have a lot of freedom which is nice as comedians. You have this kinetic energy on stage that’s unmatched. Are you that energetic when you’re talking into the mic voicing these animated characters? Oh you’ve gotta be. I mean, I believe you have to really do what the character is doing physically so that it sounds right. I feel like I can hear when an actor is just standing there delivering the lines. If Sid is running, I’m running. I think you can hear it come to life in the voice. Before I go I just have to tell you that you are a big part of my cinematic memory. My first Rated R movie was “Executive Decision” so that movie stays with me, like most movie milestones you experience growing up. My dad let me watch it without my mom knowing and I thought it was the greatest thing ever! Ice Age Continental Drift is out on the 13th of July. Besides covering events in the US and writing reviews for HeyUGuys.co.uk, Ezequiel is the Editor-in-Chief & Head Writer over at Bestgeekblogever.com and Host of The Film Geeks Podcast on iTunes. He loves talking about movies as much as he loves watching them. Let's chat! !